ZEISS Axiocam 305 mono is the new 5 megapixel camera from ZEISS for high resolution imaging at fast speeds. State-of-the-art CMOS Global Shutter technology lets you follow and capture samples accurately. Thanks to its high dynamic range and low noise, it’s possible to acquire images with various high contrasts and intensities in a single image. A dark homogenous background helps you see even the finest structural details. And it’s a really fast camera, acquiring up to 36 frames per second at full 5 MP resolution. ZEISS Axiocam 305 mono is compatible with all ZEISS microscope stands with a camera port. 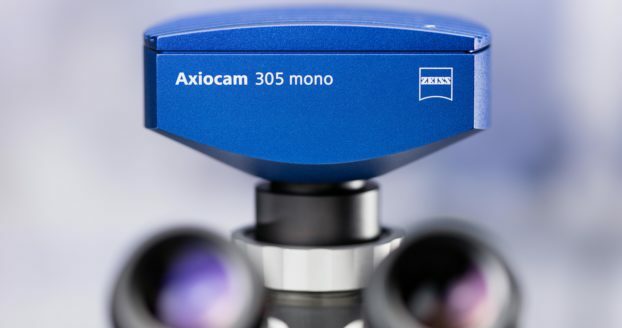 Due to the highly sensitive sensor technology and precise camera engineering ZEISS Axiocam 305 mono will deliver reproducible results every time. The sensor is temperature-stabilized, resulting in reproducible and expressive images with low noise. Easy to use ZEN imaging software brings you robust performance in an intuitive user interface through a simple and fast USB 3.0 connection.